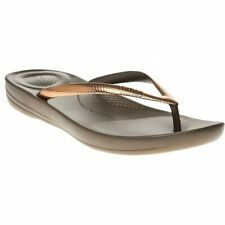 Ladies FitFlop Wobble Board Micro Soles Sandals. Worn but still in VG wearable state. Gold patent leather front with canvas light brown, red and cream stripes. Bought but never used these sandals are very comfy and smart. Fitflop Black Patent Leather Ballet Flats. Wedge heel. 6.39. A lovely pair of black patent fitflop ballerinas. Scoop front. Narrow wedge. In good condition. Photos lightened for the purpose of showing detail only. LADIES FITFLOP SLIP ON SHOES/SANDALS. THE ONE WITH AN ADJUSTABLE BUCKLE IS NUBUCK. CORK WEDGE. LIGHT CREAM IN COLOUR. 2ND STRAP IS LEATHER, WAFFLE TYPE DESIGN. TWO STRAP UPPER. Via Thong Sandals by FitFlop * Size uk 5 * tan brown leather upper * 1.25” wedge * belt-wrap buckle with silver ring detail * Microwobbleboard midsole Sandals are in good condition. Some scuffs on the side of the platform. Please see photos for more details. Very comfortable perfect summer sandals that go with every outfit. Thank you for looking. Multi-density midsoles, ergonomic, pressure-diffusing and super comfortable. This style is ideal for a slightly wider foot. APMA Seal of Acceptance, for footwear found to promote good foot health. leather and microfibre uppers. A Lovely Pair of Plum Coloured Fitflop Toe Thong Sandals. 100% Leather. Wide Leg Trousers And Maxi Dresses. Cost £45.00. Very Attractive And Go With Most Things. These stylish navy wedge sandals are created using a synthetic upper adorned with diamante crystal detailing on the vamp for an eye catching design. The leather wrapped midsole is also giving an edgy look. fitflop double strap slip on mules size 4/37 navy suede. Condition is Used. Dispatched with Royal Mail 2nd Class. These are used shoes in good wearable condition. Please see pics for best description and ask if you have any questions. SLIP ON WITH A BETWEEN THE TOE BAR. SPARKLY GOLD BAR THAT RUNS UP THE FRONT AND GOLD STRAP ACROSS THE ANKLE. FITFLOP BIKER CHIC SLIDE Size 7/41 BLACK LEATHER STUD SANDALS Condition is Used. Dispatched with Royal Mail 2nd Class. Condition is Used. Average (width) fit. FitFlop KYS Beige Leather Cross over slide sandal. 100% genuine Fitflop sandles at a bargain price. Black Denim. APMA Seal of Acceptance, for footwear found to promote good foot health. Slip-resistant rubber outsole. FITFLOP UK Size 4 (EUR37). Ladies Cream Leather Sandals. Leather Sandals. FITFLOP WOMENS GLITTERED TOE POST SANDALS - BRONZE – SIZE 6. Condition is Used. Dispatched with Royal Mail 2nd Class. Worn a few times but excellent condition. From Smoke Free Home. Buy with confidence 100% positive feedback. They are a UK Size 5. FitFlop Walkstar 3 sandals. With FitFlop microwobbleboardTM multi density midsole an ergonomic, pressure diffusing layer of cush! Great if you're on your feet a lot. Leather upper. Flipflop thong style. The FitFlop Walkstar is easy, understated chic comfort. FitFlop Walkstar Sandals. patent upper and is engineered with the famous FitFlop Microwobbleboard midsole. Comfortable can be seriously covetable. Case in point: the Fino, FitFlop's™ slinky, foot-flattering toe-thongs. The leather-lined uppers allow your feet to breathe whilst other features include a seamless built-in arch contour and slip-resistant rubber outsoles. Sandals with the X factor. A wardrobe must-have. RRP: £54.99. Built-in arch contour. Size: UK 6/EU 39. Lining Material: Textile and Synthetic. Upper Material: Textile. Changed your mind?. If the item was sealed, the seal needs to still be in place. Life's too short to wear uncomfortable shoes. Yet you not have to compromise quality and style for comfortable.